Spring is almost here in the Mediterranean and with the ability to do p2p trading between MSC and BTC as of block 290630 we want to highlight some of the new applications that are coming out. Come join us in NYC on APril 7th to celebrate with Tatiana Moroz, our host, and the NYC Bitcoin Center. Details on FB. There is not definite date set in stone yet as to when some of the earliest types of smart tokens can be issued using the Master Protocol, but the estimate is that sometime in the middle the end of April anyone will be able to create two types of smart tokens: 1. Fixed Number Token – plain and simple it is a token with a fixed amount. Of course, it could represent virtually anything, but if you plan on having it represent anything that is highly regulated we urge you to retain legal counsel with expertise in that particular domain. 2. Variable Multiplier Input Token – aka “kickstarter” token; this token has its fixed number set at the end of some period of time, during which there is a fund raiser. For example, let’s say that your church or religious organization wants to award anyone who donates 1 Mastercoin with 10 HolyCoins as a token of appreciation and so that members can give those out to their friends and family as tokens of their goodwill among each other. Recall that Mastercoin Foundation sponsored our first hackathon back in March 2014, and several winners came from that hackathon who are all candidates for releasing coins for developing their Distributed Applications. More on these in the next few weeks as we round up their pitches. Tatiana Coin – Tatiana Moroz is a singer and musician, who is putting out a new album and needs capital. Tatianacoins will be a prototype for, or proof of concept for other artists who need capital to finish projects. These particular tokens can be structured to be redeemed for special awards by an artists you support. More details to follow. One of the original block explorers for Mastercoin transactions and balances now has a Web wallet and an interface to create p2p trades involving Test Mastercoins, Mastercoins, and Bitcoins. The front end is built using HTML5 and can be accessed through browsers as well as tablets and phones. The wallet only stores data in the browser so remember to download your encrypted wallet access file and store it somewhere safe. Also one of the original block explorers for Mastercoin. It now offers a Windows Mastercoin and Bitcoin wallet and p2p trading interface. Thie wallet can be downloaded from www.mastercoinwallets.org. Bitcoin-QT is required to use this wallet. Currently in development as an open source Web based wallet for any cryptocurrency to plug into; it will support Mastercoin, Bitcoin, and there is a large bounty for someone to integrate Peercoin. CoinsManager is a free and Open-source multi-address multi-currency Portfolio. It supports Mastercoin. In short, you add your public address in the application, and it will figure out what is the related coin, what is the coin balance, and how much it’s worth in your favorite fiat currency. Mastercoin.it is a hub of information about Mastercoin. The first service is live Mastercoin rates against bitcoin and fiat currencies, as well as general Digital Currencies News. The DAC500 claims to be the very first cryptocurrency index, and it is a tracking index based on market capitalization of existing DACs. Mastercoin is included as on of the tokens being tracked. Coinmarketcap.com ranks cryptocurrencies by trading volume and “market capitalization”; it also provides charts and links to various exchanges. Currently, Mastercoin ranks 8 out of 208 cryptocurrencies tracked by the site. Providing charts and pricing data of Mastercoin-Bitcoin trading. An Android app that displays the current price of Mastercoin and can convert to several major currencies. 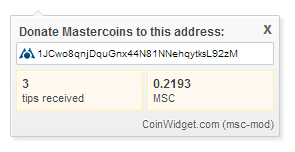 Now you can get tipped in Mastercoin via coinwidget.com’s famous donation button. Mastercoin-Faucent now supports seven authentication methods: google, facebook, twitter, coinbase, bitcointalk, reddit, and github. If you are into social network design, we’re looking to add some capabilities to send out FB wall posts, Tweets, and reddit posts when users use the faucet. The code is open source to fork orcontribute to. Masterxchange is the 1st and only full automated Mastercoin-Bitcoin exchange. Mcoin.io is a manual person to person exchange that also offers escrow. CoDA is aimed at the mutual legal defense, education and advocacy of next-generation digital markets. The Mastercoin Foundation helping with and sponsoring more hackathons this year. The next up is In Crypto We Trust during the Toronto conference later this month. And in May will be a hackathon based our out of Israel. More information coming soon! If you would like for Mastercoin Foundation and BitAngels to help your conference have a hackathon for Bitcoin 2.0 DAPPs please get in contact with us. We welcome any Mac dev who wants to write a native client for Mac. We also Welcome Apple allowing bitcoin protocol messaging to take place on iOS devices. The best thing would probablly be testing/porting MasterChest wallet on Mono. First, I get the whole open source approach of “show me the code”. You want a certain feature, or support for a given operating system? Here’s some info, go do it. I agree with that. But you are not operating in that space. As I tried to make clear, this is not about a cool new app, it’s about a new platform and a new protocol. You are supposed to be the visionaries, the ones talking about how decentralized systems can change everything and your response is, hey, here’s some documentation? Sorry if you are a farmer in Kenya, who doesn’t have the time, money or experience to contribute to the code, even if you are an incredibly smart person. Apparently, we just don’t care about you. Sorry if you are living under a monarchy or dictatorship in the 21st century, that’s terrible, but can’t you find enough time to made some code changes so we can help support you? I mean, really, if you can’t make a contribution, we probably won’t be able to talk about your cause in our next newsletter. Second, forget idealism, forget fairness. Do you really expect people to purchase MSC if they cannot setup a real, secure, local wallet on their native operating system? Chris, thanks for your concerns. As mentioned before our developers for Mac went over to another project, and it takes time to find replacements. 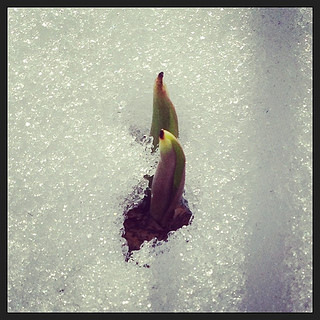 We finally have one as of the 1st of April. I’m not sure I understand where the negativity and continued attacks come from – and I actually was born under a dictatorship and our family members had to leave all our possessions which were not already taken by our government to come to the USA. The many people on this project are trying the best they can. I find all these developments, and the work you are doing, to be very inspiring and interesting, I don’t view it negatively at all. I realize my comments may have come across as overly harsh, and I apologize for that. But I stand by what I said. I only made the comments I made because I believe in what you are doing, and I believe it can make a difference. But I cannot abide the idea of a cryptocurrency 2.0 world that still lives with a nineties mentality. The OS wars are over. Selective or privileged access is out of date. I know you guys are working hard, and don’t need people second-guessing, or distracting you, or simply getting in the way. Fair enough, but I’ve been there, and the first thing lost is perspective. I’m just trying to argue for a greater one. I don’t mean to flatter you, but history might consider these projects in the same way as the Manhattan Project, but with reversed feelings. One was a scientific endeavour that became military and caused great suffering. Another may be a scientific endeavour that became financial (and political) and helped to heal society and provide a new way forward. Well I suppose sometimes a push is apprpriate, we do have someone working on this and also he has been allocated 10k to use bountysource to help speed that process up. Because I *was* going to do what apparently tons of other people did. Buy a bunch of Bitcoin (I did that part), trade for a bunch of Mastercoin, buy a stake in MaidSafe. If I had actually done that, I would have apparently not only *not* been able to make the purchase, I would have lost money as the value of Mastercoin went through the floor. “legitimacy”. It sure doesn’t guarantee it, but it seems like a pretty damn good filter. Very happy I didn’t ignore it. Actually, to go further, I think this will be the death of Mastercoin. If Mastercoin still exists in five years, I will come back and apologize.